How much do you spend on parsley over the year? Or fresh basil or cilantro? The $1.99 supermarket bundles don’t cost that much but it all adds up over time. 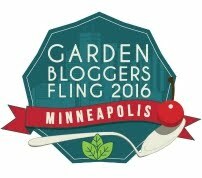 If you want to save money, have fun, and very little work, an herb garden is the answer. Lots of books about herb gardens have beautiful photographs of herbs set out in geometric parterres bordered with box or some such, but that elegance takes work to maintain. My herb gardens are strictly utilitarian and there are few rules. All herbs need full sun and well drained soil. Herbs are not particularly fussy about the quality of the soil, but it never hurts to dig in some compost when you are planting herbs, or anything else. 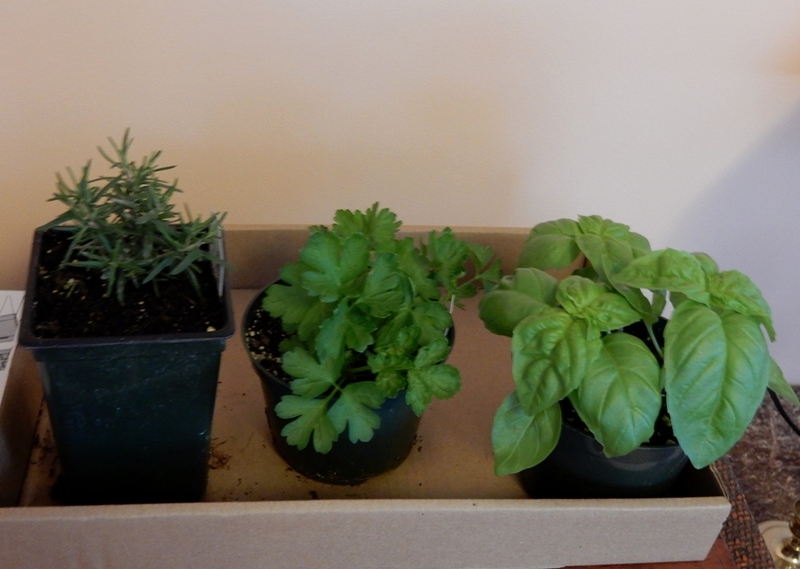 Parsley, cilantro, dill and basil are annual herbs. They are easy to grow from seed, or you can buy a flat of six starts. Just a few plants are enough to enjoy the herbs fresh, and still have enough to dry and put by when the autumn chill arrives. Annual herbs will not come back the following year. There are also different varieties of the familiar curled parsley from the new Favorit to Moss Curled II. Cilantro looks similar to parsley but has a very different sharper flavor. Cilantro is an interesting herb because the foliage is called cilantro, but it sets seed which is called coriander which can also be harvested. Cilantro goes to seed in a fairly short time, so it is best to keep seeding it every two or three weeks all summer so you can have the leaves all season, and store the dried coriander seeds for the fall and winter. I would grow dill even if I never used it. I just love the fragrance. 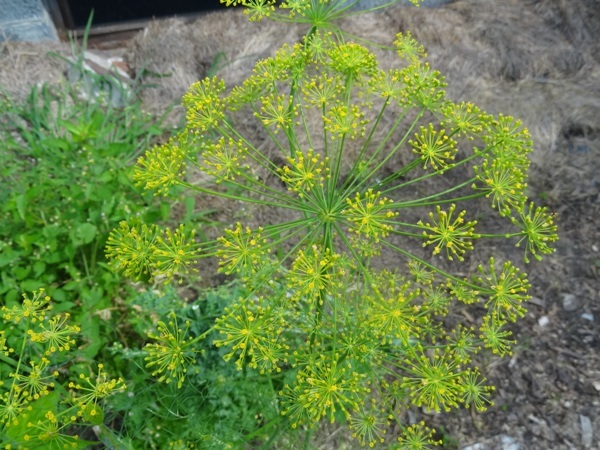 Fresh dill foliage can be used, and the big crop of seeds can be dried and stored for later use. Goldkrone was bred to give lots of leaves before it goes to seed. I like that idea a lot. Basil has become so popular that now there are many cultivars from the familiar Genovese used in Italian cuisine to Thai basils like Kapoor Tulsi, otherwise known as Holy Basil, citrus basils like Mrs. Burn’s Lemon, fine leaf basils like Pluto, perfect for a container and purple basils like Purple Ruffles for color, flavor, garnish or purely as an ornamental in the garden. Then there are the perennial herbs. Some of them will over winter in the garden, at least most of the time, while others like rosemary will need to be brought indoors for the winter. Of course, you can always start perennials anew each spring, as necessary, or as you wish. In Heath I could easily keep my rosemary plant through the winter in a cool sunny room if I kept it watered. In Heath I had cool sunny rooms, but this is not so in Greenfield. My four year old rosemary dried up and died in my warm house because I do not have different heat zones. However, I left a potted prostrate rosemary out on a south facing unheated porch expecting it to die. I didn’t even bother watering it for several weeks. But it didn’t die; I began watering it again and except for a couple of really cold nights we left it on the porch. It is thriving. Thyme is familiar as a flavoring and as a ground cover. I used plain old thyme, but there are improved varieties of culinary thyme as well. Johnny’s Orange thyme has a bit of citrus flavor, as you might expect, and Summer thyme is billed as having more flavor than the standard thyme. 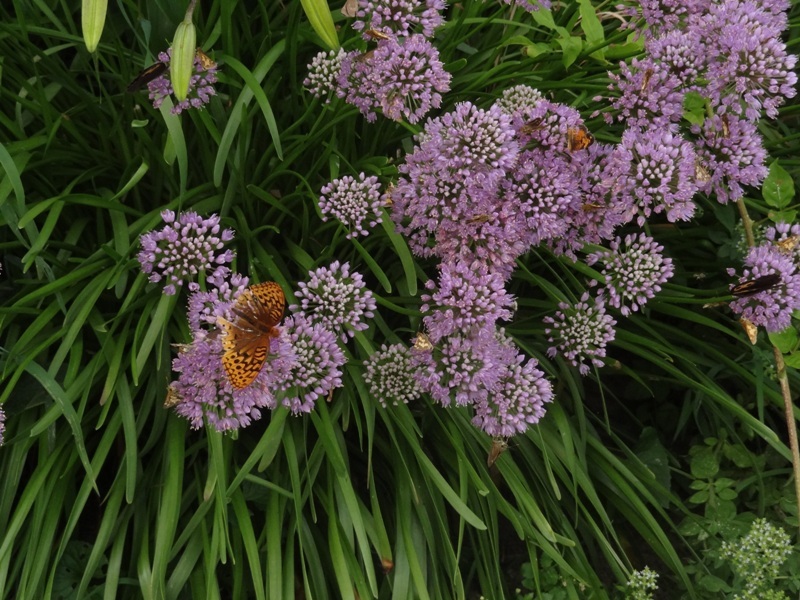 Chives have onion-y tasting foliage and globe shaped flowers that are edible and a pretty addition to a salad. These are the easiest of herbs to grow and indestructible, coming back year after year. Sage is one of the most popular perennial herbs. A single plant may be all you need. I kept a single sage plant going for several years in my Heath garden. I harvested fresh leaves as I need them during the summer and fall, but always dried a few for winter use. Garden sage has woody stems and soft gray-green leave. It produces small blue blooms in the summer which can be eaten. I’m not sure whether to call chervil an annual or perennial. I planted it once in my herb garden, and it reliably self-seeded and came up without my help every spring. 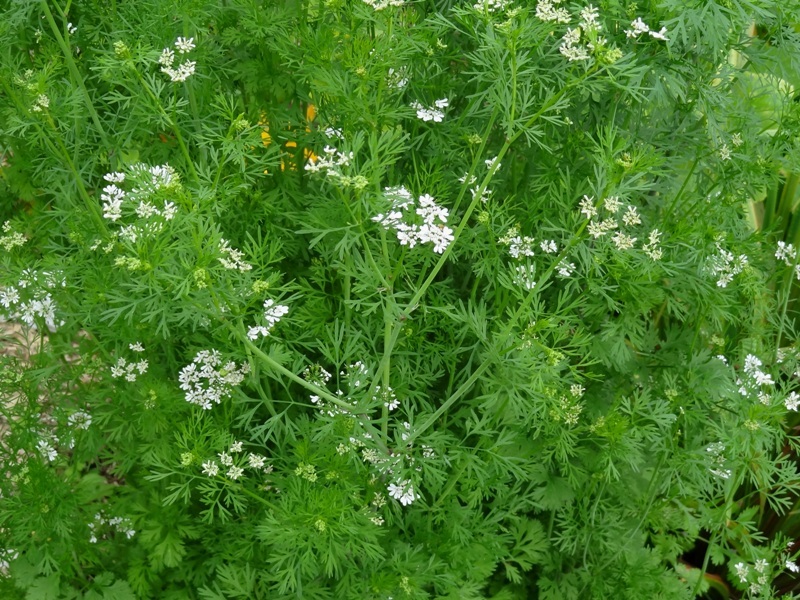 Chervil has very delicate lacy foliage, more like carrot foliage than parsley. It has a slightly anise flavor and can be used in salads. Many people like to put some minced chervil in their omlettes. I also have grown lemon balm for the fragrant, citrusy foliage which I would use as a flavoring and garnish in iced tea. This perennial herb is pretty and a strong grower, but not invasive. It is not to be confused with lemon verbena. Like dill, I would grow it just because it has such a pleasing fragrance, as well as pretty foliage. I have said herb gardens don’t have to be elegant, but they should be near the kitchen door where the cook can snip away, as the meal is being prepared. Sun and well drained soil are all you need. Great post with a lot of information!